Most if not all of the Howes of Carrollton, Kentucky, were political, I suppose. They paid attention to elections, supported their chosen candidates, and discussed politics within the family and the community. Our scrapbooker Sarah Eva Howe was writing about her own political opinions while she was still in elementary school! In today's post, we learn about John Junior Howe, who actually ran for political office. 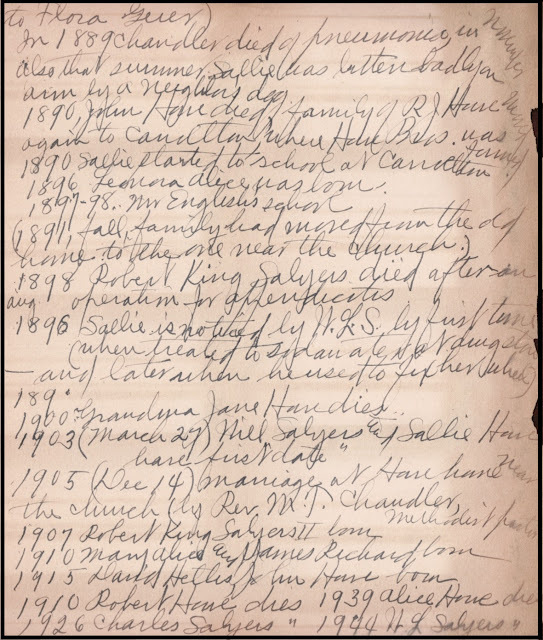 Some historians and genealogists misidentify him as John Howe, Jr., but family records and other writings clearly have "Junior" as his middle name. His parents, William Ficklin Howe and Louisiana "Lou" Winslow Howe, named him for William's father, the Irish immigrant John Howe (1823-1890). John Junior Howe was born 5 November 1879 into the third generation of Howes to live and work in Carrollton, Kentucky. (See his childhood photo in the post about the "Highly Accomplished Family of William Ficklin Howe.") Sarah mentioned him several times in her scrapbook writings, commenting about how well he did in school and how proud she was of his accomplishments. He was her first cousin, four years older than Sarah, and the brother of Sarah's cousin/best friend Jenne Howe. John was one of nine graduates in the Carrollton High School Class of 1896. He received a bachelor's degree in 1900 and a master of arts degree there in 1903, both from Kentucky Wesleyan College (then in Winchester, Kentucky). He went home to Carrollton to "read law" at Winslow & Winslow – the law firm of his maternal grandfather William Beverly Winslow and uncle George B. Winslow. Eventually the firm became known as Winslow & Howe, a general law practice that listed among its clients the Carrollton National Bank, Carrollton Furniture Manufacturing Company, Jett Brothers Distilling Company, Adkinson Brothers Company, Howe Brothers, L&N Railroad, and Carrollton & Worthville Railroad. The Winslows and Howes had family connections with several of those businesses. Like several of his relatives, John earned his law degree at the University of Michigan (1909). He was a member of Kappa Sigma Fraternity. 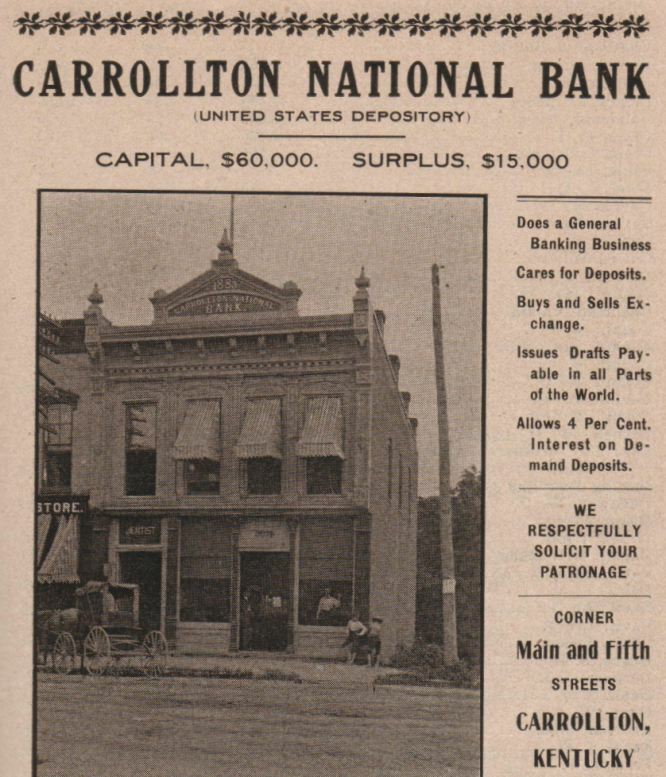 1909 to 1911 – cashier of the City of Carrollton. 1913 (December) – commonwealth's attorney for the 15th Judicial District, which included Boone, Carroll, Gallatin, Grant, and Owen counties. 1915 – traveled to Washington to offer his services to the Judge Advocate General. Apparently he was not called into national service, but he served on the Carroll County Draft Board. 1924 – primary election candidate for U.S. Senate (source: Political Graveyard); campaign headquarters at the Seelbach Hotel in Louisville. He named Ward C. Yager, county attorney of Gallatin County, to be temporary chairman of his campaign. At his undergraduate alma mater, Kentucky Wesleyan, students formed a “Howe for Senate Club” with membership exceeding 200. In spite of strong support from his home region, he lost the election. John was a leader in several local, state, and national Masonic organizations and a steward in Carrollton Methodist Episcopal Church, South. Somehow he also had time to serve as a director of Carrollton National Bank (founded as Howe & Son by his grandfather and father) and secretary of Howe Brothers (the retail store launched by his grandfather, father, and uncles). His name was popping up in political circles when he was still in his 20s. By his 30s, he was elected to the post of commonwealth's attorney. Later he became a federal prosecutor.
. . . the Democrats of Kentucky still talk of electing a governor some time soon. And many of them mention the name of John Junior Howe (Michigan) when they talk on this subject. If they will take our advice they'll decide on Colonel Howe at once; they could not do better. He would wear gubernatorial honors gracefully and easily and perform gubernatorial duties fearlessly and well. Here's Howe! By the way, John Junior was elected prosecutor for the Fifteenth Judicial District of his state in November, for the third time and without opposition, as exclusively predicted by The Caduceus and everybody else. Based on what info I can find about John, he never married. He lived his entire adult life with his mother and two unmarried sisters, Lillie and Jenne. He died 29 July 1939 in Good Samaritan hospital in Cincinnati. His death certificate reports cause of death as "aortic insufficiency with cardiac decompensation" – in other words, congestive heart failure. Like his parents and several of his siblings and cousins, he was buried at the Carrollton IOOF Cemetery. A few months ago I found for sale a collection of Howe-related ephemera. The collection included about 93 pieces – letters, telegrams, checks, notes, and other items. The seller's description pointed out that most of the correspondence was between John J. Howe and one of his uncles, Tennessee attorney Henry M. Winslow. Several of the letters were about John's unsuccessful primary campaign for the U.S. Senate. Many others concerned legal actions involving a ferry business in Ghent in the Winslow-Howe home county of Carroll (Kentucky). Those letters apparently included "some unflattering dialogue" about a family named Graham. Did I buy that collection? Of course I did! In future posts, I'll report anything of interest. Part Three of Sarah Eva Howe's handwritten chronology is what I think may have been the beginning of a do-over, a narrative version of events from 1882 to 1944. While it is short and repeats dates and names, it provides important details missing from Parts One and Two. As before, brackets in this transcription enclose my own clarifications, identifications, and comments. 1882 Robert James Howe [and] Alice Cost Howe married Oct. 11 at 516 W. Court St. (home of Richard and S.E. Arnet Cost) by Dr. Joyce (afterwards bishop). After wedding trip ending with reception at Carrollton, they lived in Walnut Hills, Cincinnati, at home of Mrs. Charlotte Johnson, on Oak St.
1883 August – Sarah Eva [Howe] was born at this place. 1884 (winter) family of R[obert] J Howe moved to Carrollton, lived there a year, during which time Sallie [Sarah Eva Howe] was baptised. Going back to Cincinnati early in 1885, after trip to Niagra Falls, they stayed for several months at the home of Mr. and Mrs. George Johnson on Price Hill, then moved to Price Avenue home where in the summer of 1886 both Robert and Sallie had typhoid fever. In 1887 came trips to Lake [word unreadable] where Sallie’s fourth birthday was spent by the lake (Erie). In the winter and spring of that same year Sallie [Sarah Evan Howe] had scarlet fever, a bad case. In April 1888 Chandler [Sarah's brother] was born, named for a friend of the family, Chandler Harper. 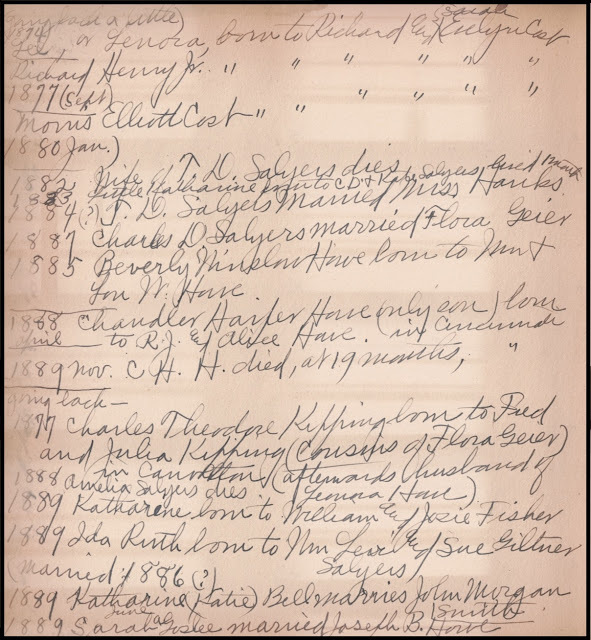 1887 Charles D. Salyers married again to Flora Geier. 1889 Chandler died of pneumonia, in also that summer Sallie was bitten badly on arm by a neighbor’s dog. 1890 John Howe died, family of R[obert] J Howe moved again to Carrollton, where Howe Bros. was formed. 1890 Sallie started to school at Carrollton. 1896 Leonora Alice [Sarah's sister] was born. 1897-98 August Robert King Salyers [brother of Sarah's future husband] died after an operation for appendicitis. 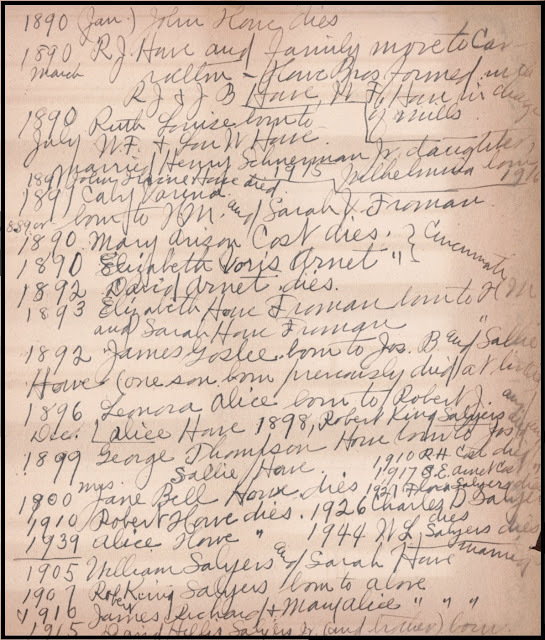 1896 [last number overwritten and hard to decipher] Sallie is noticed by W[illiam] L[evi] S[alyers] by first time (when treated to soda [word illegible] at drug store – and later when he used to fix her wheel). Sarah also listed the births of five grandchildren born from1942 to 1951. So ended Sarah's Howe-Salyers family chronology. In Part 2 of Sarah Eva Howe's handwritten chronology of events in her Howe family and her husband's Salyers family, we revisit 1883, also the birth year of Sarah's beloved cousin Jenne, and continue to the 1930s. During that time, Sarah gave birth to five children, including two sets of twins. There is one entry for 1944, the death of Sarah's husband, William Levi Salyers. Sarah apparently wrote dates and events as they came to mind. Notice her two references to "going back." Parentheses are original to the handwritten chronology. Brackets enclose my own clarifications, identifications, and comments. 1890 Ruth Louise born to W.F. & Lou W. Howe, July. 1915- married Henry Schuerman Jr. [Ruth and Henry's] Daughter Wilhehmina born 1916. 1891 John Irvine Howe died. 1893 Elizabeth Howe Froman born to H[iram] M[cMakin] and Sarah Howe Froman. I've struck family history gold! 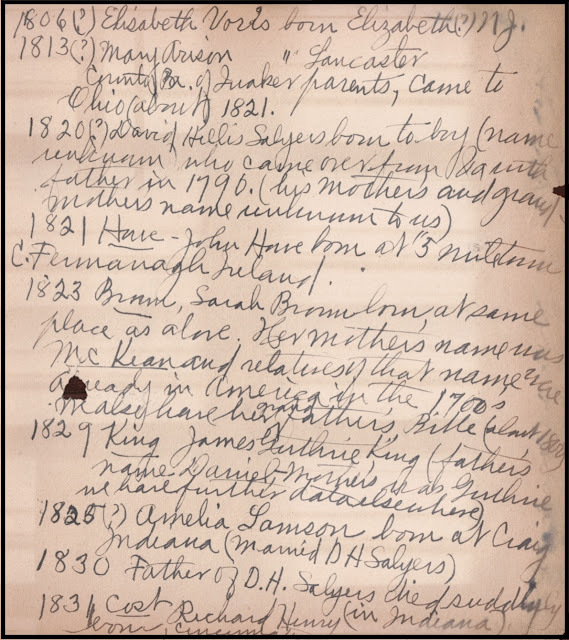 – Sarah Eva Howe's handwritten, year-by-year account of births, deaths, and marriages in her Howe-Salyers family. The 11 pages are in one of the scrapbooks Sarah compiled after her marriage, as she recorded family history for her children. Among the many names and dates, I've spotted some surprises and a few discrepancies that I want to sort out. In the meantime, here is my transcription of the first 93 years of Sarah's written chronology – 1790 to 1883, the year Sarah was born. She wrote in short phrases with explanations stuck here and there as she thought of them. Some years are out of sequence. I can picture her writing this history, suddenly remembering a birth that occurred in 1859 after she had already listed events that happened in the 1860s. Within the transcript, parentheses are original to Sarah's handwriting. Brackets contain my own comments and clarifications. I've linked some names to previous posts about Sarah's ancestors. In several cases, links are duplicated because names are listed in the chronology more than once. 1790(?) Salyers — grandfather of D.H. Salyers 1st came to Kentucky with small son. 1790 Howe-Brown — Both families were living in “5-mile town.” We have a Bible dated 1790, property of Mrs. Brown, mother (or grandmother) of Sarah Brown Howe who came to Kentucky in 1847 (my grandmother) with her husband John and small son Will. 1772 Cost — Daniel Cost, [2 overwritten with a 4, or vice versa] years old, was left an orphan when parents were killed by Indians in Maryland, he was “bound out” to Major Beyer, who raised him as a son (of Philadelphia). 1800 Daniel Cost was married to Mary Fisher at home of Major Beyer (now in Maryland). 1817 Benjamin Lamson & Abigail Freeman married in Ohio on way to Indiana (both born in 1790s). 1806(?) Elisabeth Voris born Elizabeth(? ), NJ. 1813(?) Mary Arison [ditto mark = born] Lancaster County, Pa., of Quaker parents, came to Ohio (about) 1821. 1823 Brown — Sarah Brown born, at same place as above. Her mother’s name was McKean and relatives of that name were already in America in the 1700s. [Name not legible] have her grandfather’s Bible (about 1800). 1835 David Arnet and Elizabeth Voris married in New Jersey. 1849 Charles David Salyers born on fathers plantation near Greenville, Miss. 1857 Joseph Brown Howe born near Champaign Ill.
1877 T.D. 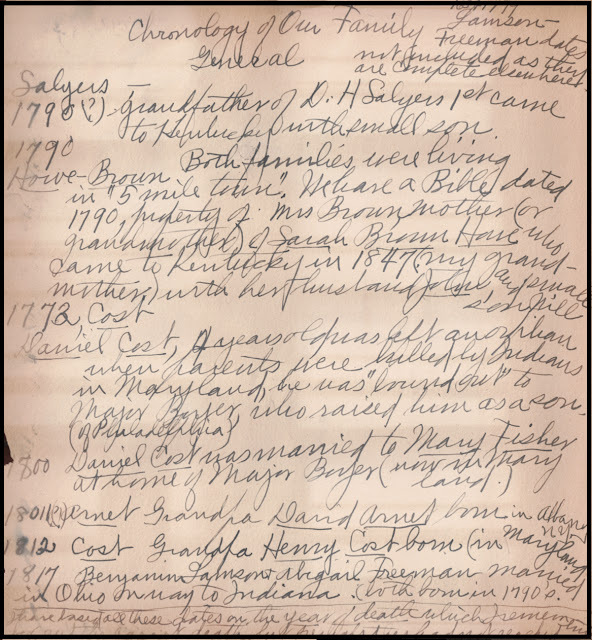 Salyers married to Miss Knox of Vevay, Ind. 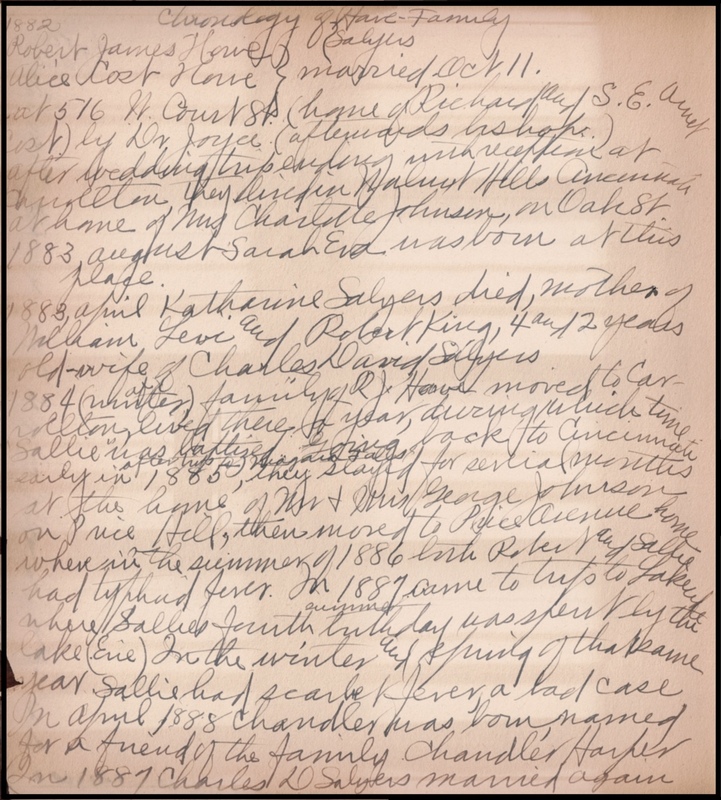 Coming in the next post: Howe-Salyers Chronology Part 2, from 1883 to 1915, plus some additional "forgotten" earlier years and a few notes about Sarah's grandchildren born in the 1940s.